Sir Peter Alexander Ustinov (16. dubna 1921, Londýn, Anglie, Spojené království - 28. března 2004, Genolier, Vaud, Švýcarsko) byl britský herec, humorista a novinář. 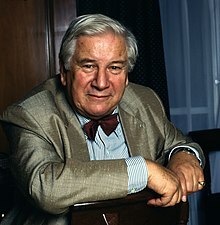 When you think of Ustinov, then you immediately think of his humour and his sharp intellect. But behind [all that] there was always an interest and affection for people. ↑ What they said about ... ... Sir Peter Ustinov. theguardian.com [online]. 2004-03-31 [cit. 2015-10-31]. Dostupné online. Stránka byla naposledy editována 30. 11. 2018 v 20:19.